Quality apparel designed for outdoor activities is a must for anyone who spends a lot of time in nature, especially when the temperatures start to dip. As an outdoors enthusiast who enjoys cold weather camping, hiking, and kayaking, I was really excited when the Craghoppers team offered me an opportunity to review a few of their autumn/winter pieces. As a frequent traveler and fan of outdoor adventures, I am always looking for easy-to-pack pieces that meet my needs without taking up a ton of space. My past experience has been that bulk is a necessary trade-off for being able to travel with a warm, down jacket. However, thanks to this great jacket, I now realize that I was wrong! For winter travel itineraries that include outdoor activities, Craghoppers' VentaLite II Jacket is a perfect choice! This jacket is filled with down (60%) paired with the company's own "ThermoElite Hybrid" synthetic insulation (40%). The result is a lightweight jacket that keeps the wearer super-warm without the bulk. It packs down to a very small size, easily fitting into a backpack or a small corner of a carry-on bag. In addition to being easily packable, it's also comfortable and warm. It is fairly fitted and true to size, but doesn't have that suffocating feel that some jackets do. It has some other benefits that are particularly great for cold weather travel and outdoor adventures. For example, it is both windproof and water resistant, which means it's a great choice for fall and winter hiking and other outdoor activities. It also has four pockets, a feature that makes it easy to carry along various types of gear within easy reach. The two exterior pockets zip and have radio-frequency identification (RFID) blocking capability, so they are perfect for keys, emergency cash, a credit card, your driver's license, etc. There are also two deep interior pockets that don't zip, which are ideal for snacks, lip balm, first-aid items, maps, and other similar items. All in all, this is a great jacket for anyone who spends time outside when it's chilly, as well as for those who travel during the winter. 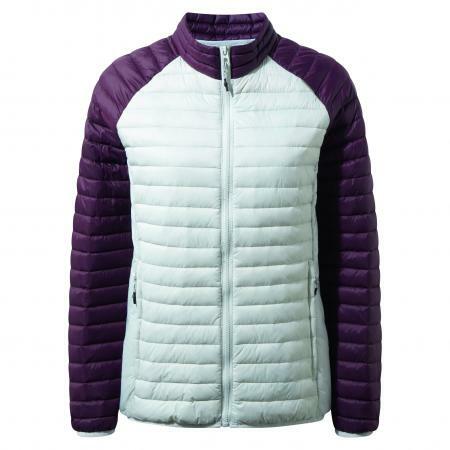 It is available for women and men for around $100, which s a great price for such a high-quality jacket. In addition to being able to try out the VentaLite II jacket for myself, my hubby had an opportunity to check out Craghoppers' Kiwi Long-Sleeved Shirt. This is a very well-made, rugged shirt ideal for outdoor activities, but great looking enough to wear for other types of casual occasions as well. This well-made shirt is great looking and easy to care for (it's a wash and wear blend of polyester (65%) and cotton (35%), but that is not where its advantages stop. Two of this shirt's most unique - and beneficial - features are not even visible when you look at it. That's because its special fabric protects the wearer in two specific ways. SolarShield: The fabric offers sun protection, with an ultraviolet protection factor (UPF) of up to 50. NosiDefence: The fabric offers protection against biting insects via "a robust barrier of specially constructed ﬁbres" that are difficult for bugs to penetrate. This shirt has three pockets, including two button-flap pockets on the front and a deep security pocket inside. This shirt can actually be worn all year. It's great for cool weather activities under a jacket, but you can also wear in during warmer seasons as well, depending on what types of activities you're engaged in. For example, my hubby uses this style of shirt over a t-shirt when we go kayaking during the summer for sun and bug protection benefits. The sleeves roll up easily and can be buttoned in place at 3/4 length. 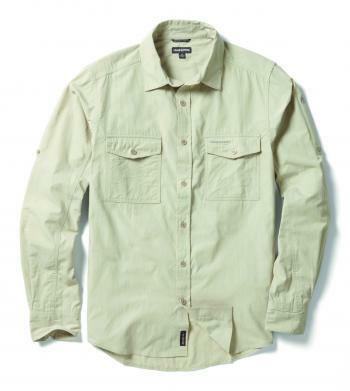 This is a great shirt for outdoor adventures and any occasion where casual wear would be appropriate. It costs $45 and is available for men only, though the brand also offers ladies options (in other styles) with SolarShield and NosiDefence. While I have only reviewed a few pieces in Craghoppers' collection, I feel comfortable saying that the company's outdoor apparel is high quality and a good value. These two items certainly are, and other reviewers (such as Constant Traveler and HikersBlog) seem to view the brand favorably as well. Additionally, the fact that the company has been in business since 1965 also says a lot about the quality of their products. In the competitive outdoor apparel industry, a company wouldn't be able to stay in business that long without providing value to customers.